Yaser Bushnaq, a former president of the Islamic Association for Palestine has been indicted in Virginia for naturalization fraud. In applying to become a U.S. citizen in 2000, Bushnaq is accused of failing to disclose his affiliations with a series of organizations that the indictment links to the Muslim Brotherhood and Hamas. The indictment clearly defines the IAP as "an overt arm of the covert organization known as the Muslim Brotherhood." He was the IAP's president from 1989-1991. That he worked under the pseudonym Yaser Saleh. He was a board of trustees member for the Al Aqsa Education Fund, "an organization that sought to raise funds for Hamas." He was an authorized signatory for the Marzook Legal Fund, established in 1996 to support Hamas leader Mousa Abu Marzook after his arrest by U.S. authorities. 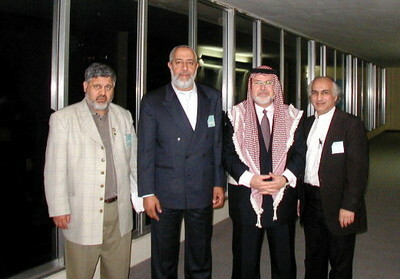 Former IAP President Yasser Bushnaq is shown here at the "Beirut Meeting" in January 2001. The State Department said the meeting included "members of several terrorist organizations" including Hizballah and Hamas. To Bushnaq's right in this photograph is Ahmed Yousef, now a Hamas spokesman in Gaza, and Abdurrahman Alamoudi, former head of the American Muslim Council serving a 23-year prison sentence after pleading guilty to illegal dealings with Libya and aiding a plot to assassinate the Crown Prince of Saudi Arabia. The indictment claims he also failed to disclose a 1996 trip to Iran, which had been subject to U.S. sanctions as a state sponsor of terrorism the year before. And, the indictment alleges, Bushnaq did not tell immigration officials he spent most of 1998 living and working in Saudi Arabia. That extended absence from the United States "would have disqualified the defendant from obtaining naturalization because he no longer would have been a valid legal permanent resident." A grand jury in the Eastern District of Virginia indicted Bushnaq Sept. 12 but it was not unsealed until Tuesday. Bushnaq remains at large and his whereabouts may be unknown. In a motion dated January 10, Assistant U.S. Attorney Gordon Kromberg wrote that unsealing the indictment would not jeopardize any ongoing investigation. Bushnaq is an unindicted co-conspirator in the Hamas-support trial of the Holy Land Foundation for Relief and Development (HLF), which, along with the IAP, is listed as part of the Muslim Brotherhood's Palestine Committee operating in America. The committee was created to advance the Hamas cause in the U.S. Its members gathered in Philadelphia in the fall of 1993 to discuss ways to "derail" the Oslo Peace Accords, which the group feared would marginalize the Islamist Hamas. Intercepted telephone calls show Bushnaq was invited to the Philadelphia meeting but did not attend. The HLF case is expected to be retried later this year after jurors deadlocked on most of the counts involved. Evidence presented at the trial showed the IAP and HLF had a close working relationship. But audience members at the December 1989 conference of the Islamic Association for Palestine shouted "Allahu Akbar" ("God is great") when the masked Hamas spokesman talked about an ocean of blood. In a videotape of the conference, Yaser Bushnaq, a Dallas resident who was then president of the Islamic Association for Palestine, welcomed participants. A Hamas banner draped a table, from which one speaker after another praised Hamas. The conference was named after Abdullah Azzam, considered a Hamas martyr. Bushnaq's work with the Marzook Defense Fund is not the only instance of his support for people directly involved in plotting on behalf of terrorists. Bushnaq derided the September 2003 arrest of American Muslim Council President Abdurrahman Alamoudi as an attack on Muslims in America. In a release from Solidarity International, Bushnaq called the arrest "extremely tragic" adding "The United States Attorney for the Eastern District of Virginia and the U.S. Attorney General have apparently begun to destroy the lives of Arab Americans and Muslims based on newspaper articles and fabricated allegations." [t]he September 2003 arrest of Alamoudi was a severe blow to al Qaida, as Alamoudi had a close relationship with al Qaida and had raised money for al Qaida in the United States. Bushnaq was pictured with Alamoudi and Ahmed Yousef, also an unindicted co-conspirator in the HLF trial and now a Hamas spokesman in Gaza, at what was called the "Beirut Conference" in early 2001. During a daily press briefing on February13, 2001, a State Department spokesman said the meeting included "members of several terrorist organizations (who) met in Beirut in late January and that the pledged to work together against Israel. We believe the participants included Hizballah and Palestinian rejectionist groups." group formed after the Sept. 11 attacks against America. In that role, Bushnaq was among the signatories to a March 2002 ACLU letter to then-Attorney General John Ashcroft, urging that FBI guidelines on domestic surveillance not be relaxed. Such a move "is unwise, and unsound law enforcement policy," the letter stated. Yaser Bushnaq, chief coordinator of the Solidarity USA civil rights group, which Alamoudi helped launch, said yesterday that if Alamoudi was trying to improve U.S.-Libyan relations, "it would fit with the man I know, who would try to bring a just solution between the two countries, and for the victims of the Pan Am incident." He said that "Alamoudi believes in reconciliation, and in America." As is the case with other Hamas-linked and Islamist individuals in the U.S., Bushnaq contributed to the congressional campaigns of Rep. Jim Moran (D-VA) and former Rep. Cynthia McKinney (D-GA). The statute Bushnaq is accused of violating carries a maximum prison sentence of 25 years if the crime helped "an act of international terrorism," or 10 years if the terrorism connection is not found by the court. Yasser Bushnaq is living now in Amman (JORDAN) /// he is doing business in amman (khalda) in west amman ...... yasser Bushnaq seems to have great refuge in Amman and not worring about his past while he was in Richardson/ Texas where he was in same group of Hamas and Ikhwan there in late eighties and nineties / i am sure he was in total knowledge and helping with financing Hamas through HOLY LAND FOUNDATION whose directors and officers were sentenced lately for many many years in Dallas jails for financing Hamas but Yasser Bushnaq managed to escape to JORDAN where he is now !! !